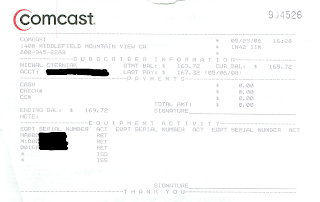 First there were problems that made me cancel Comcast service but real problems started on 5/29/2008 when I went to the Comcast office in Mountain View, CA to cancel my service. I brought with me all the equipment (the Internet/VOIP modem, the DVR and the remote control). I got a receipt for the equipment and I was told that my service was canceled. Little did I know about what's going to unravel. Here's a copy of the return receipt. I blacked out personal information like my account number and parts of serial numbers of the equipment but otherwise, this is exactly what they gave me.